This goes for all nurses. 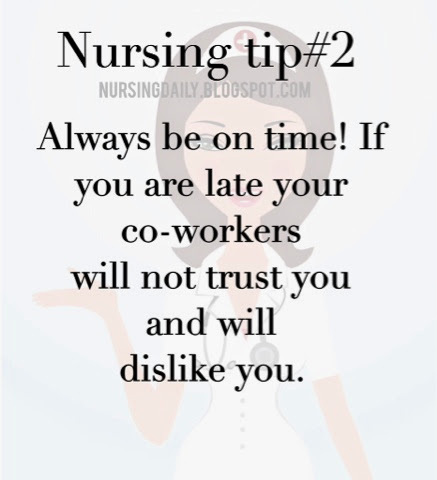 However; this tip is crucial for new grad nurses and any nurse that is starting a new job. Showing up late is a sure way of setting yourself up for failure. Imagine working a long 12.5 hr night shift. It is finally 7am and time to go home. SIKE! You can't go home because the oncoming nurse doesn't show up until 7:15am. So after and hour of giving report you finally get to click out around 8:30am. On your very fatigue drive home you realize you have to come back and do the same thing over again tonight. The cycle of lateness is a sure way of giving yourself a bad name and turning your staff against you. They will not be able to trust or depend on you. If you are a chronically late person (even if it's one minute late) please work hard on trying to get to work early. 1:Pack your work bag before you go to sleep. 2:Pack your lunch in storage containers for 2-3days at a time. 3:Keep your work badge in your car/ nursing bag. 4:Make sure you scrubs are washed at the start of the week. On your last work day of the week wash your scrubs. 5:Set multiple alarms (clock,phone, iPod, watch,etc...) at different time frames. 7:Do not turn the television on when your getting ready for work. 8:Don't stop and chat with your friends that work downstairs. Wave and keep it moving. 9: Don't spend more than 2-3 mins top in the locker room. Any longer and your wasting time. 10: If you are ahead of schedule. Head into work early. If you stop off somewhere you run the risk of being late. Once you start implementing these 10 steps you will start to notice a change in the rapport between you and your co-workers. They will be impressed with you new initiative to be on time and slowly you will regain their trust. Good luck!